To me pizza is an open sandwich, It’s fun to be creative with the combination of toppings. It’s almost like spreading your favorite dish over the pizza dough. 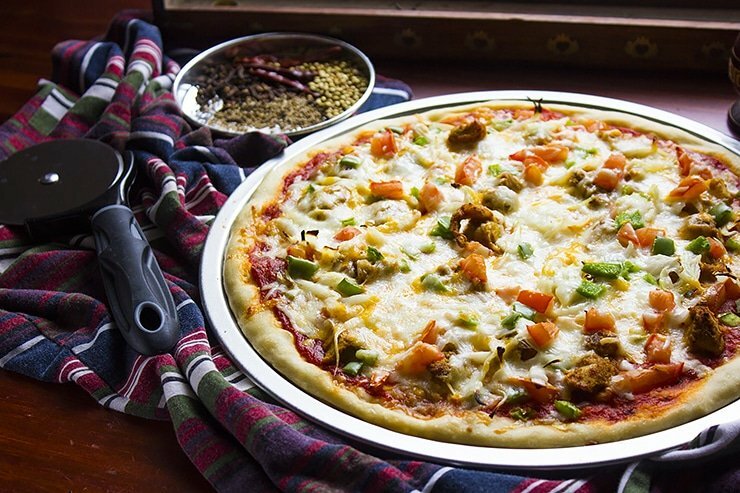 Today and because I crave pizza and Indian food often, I bring you Chicken Tikka Pizza. Perfect topping on a perfect pizza dough! Mostly, no one enjoy eating store bought pizza dough, it has no taste. In today’s recipe you’ll learn how to make a delicious pizza dough, it has a fluffy texture and is flavorful. You might decide to cut a bigger slice this time! 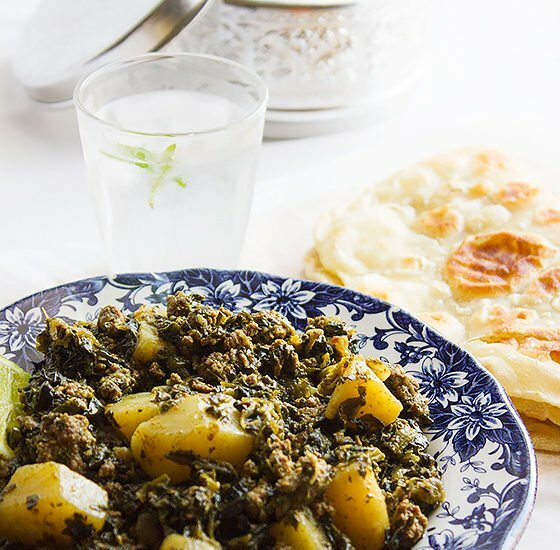 I’m sure you’ll love the combination of Indian and Italian flavors in this pizza. The chicken came out juicy and tender, the marinara sauce helped in retaining moisture in the dough and prevented the chicken from overcooking. 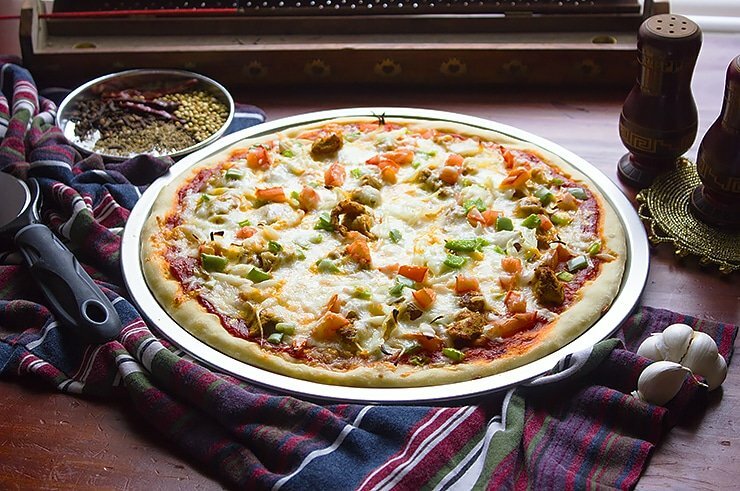 If you loved the idea of adding an Indian touch to your pizza, then I would love to suggest another Indian/Italian version made by my friend Richa at My Food Story. She made an amazing Whole Wheat Keema Pizza. 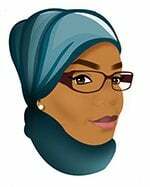 Pay her blog a visit and enjoy all the goodies she creates. 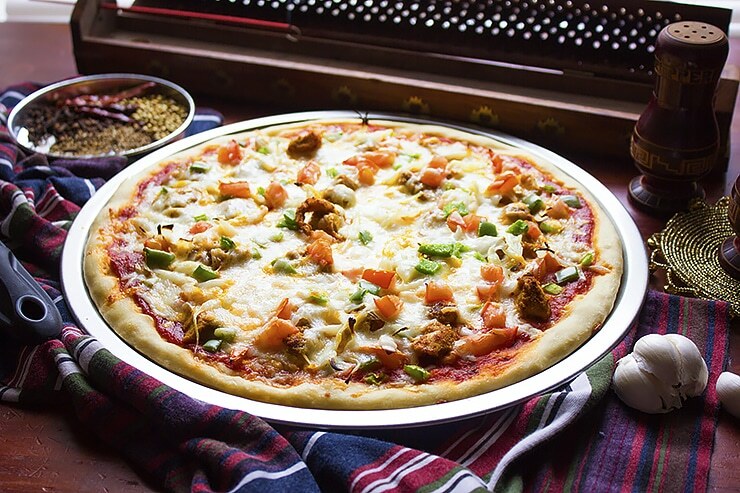 As for my recipe for Chicken Tikka Pizza, here you go! 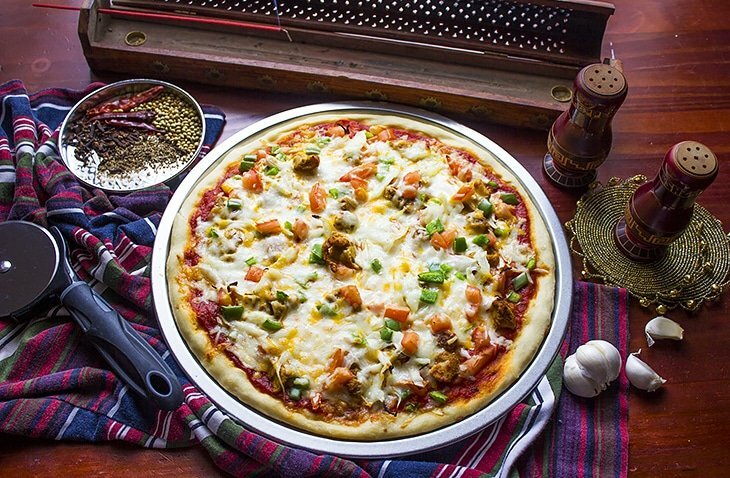 Chicken Tikka Pizza is a perfect marriage between an Indian and Italian recipe, bringing you a unique and delicious flavor. Let us not forget the light, flavorful, and fluffy crust. 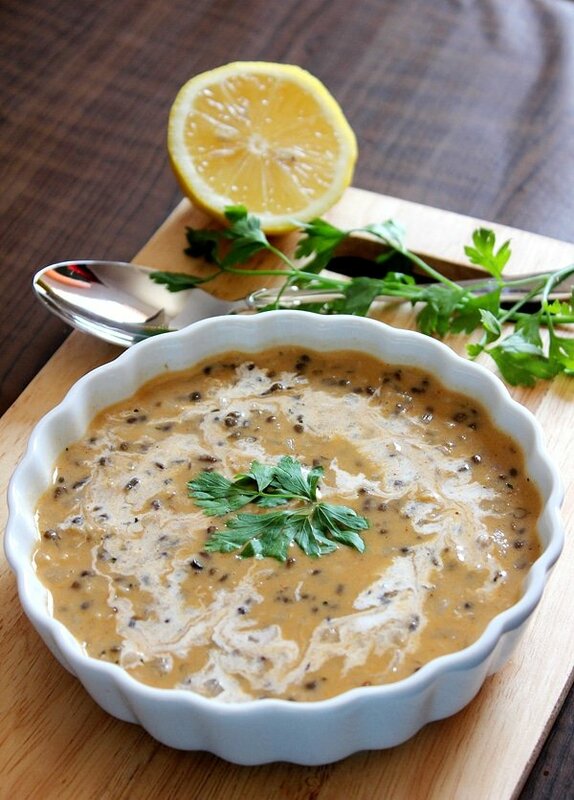 In a bowl, add all the ingredients and mix well, cover and place in the fridge for one hour. Heat a frying pan and add around two to three tablespoon oil. When the oil is hot, add the chicken and shallow fry until the chicken is cooked, may take around 10 minutes. 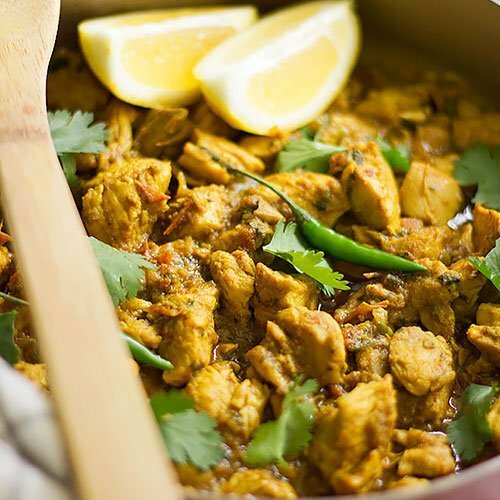 Remove the chicken tikka from heat and keep aside to cool. Evenly spread the chicken and the extra toppings (except the cheese.) on the dough. 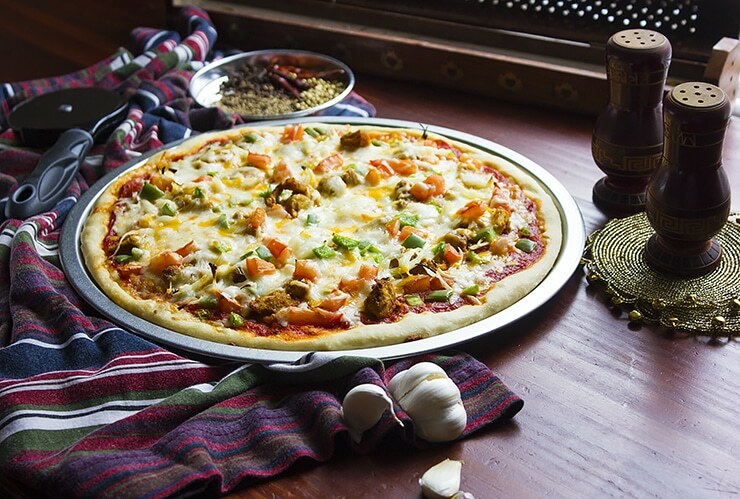 This looks amazing – I love the idea of an Indian-inspired pizza! It looks gorgeous! 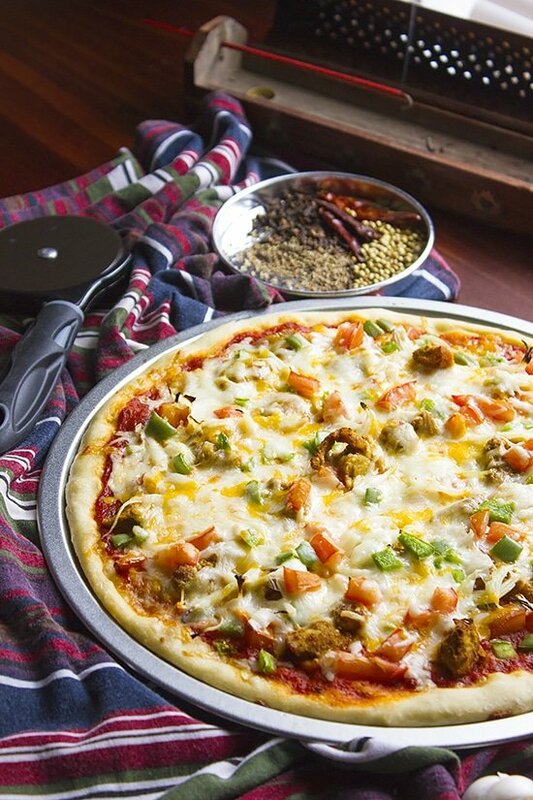 Combination of Indian and Italian flavors in a pizza? That is very unique! You are right Nagi, I never thought that Italian and Indian mix will taste this good! This looks amazing Muna! Your pizza has come out perfectly and I’m a big fan of chicken tikka, so I’m sure this will be taste great.